We make really useful, colourful things. Here in the workshop we also make custom covers for Butterfly Chairs. Lizzie Geddes of Chops for Tea and I teamed up over a year ago to present www.TheButterflyChair.com.au. This started out as a project to see if we could make a product entirely in Castlemaine. Turns out we could, and did. At the moment, we’re just making the covers but it seems there are quite a few old frames sitting out there in sheds waiting to be spruced up and sat upon. 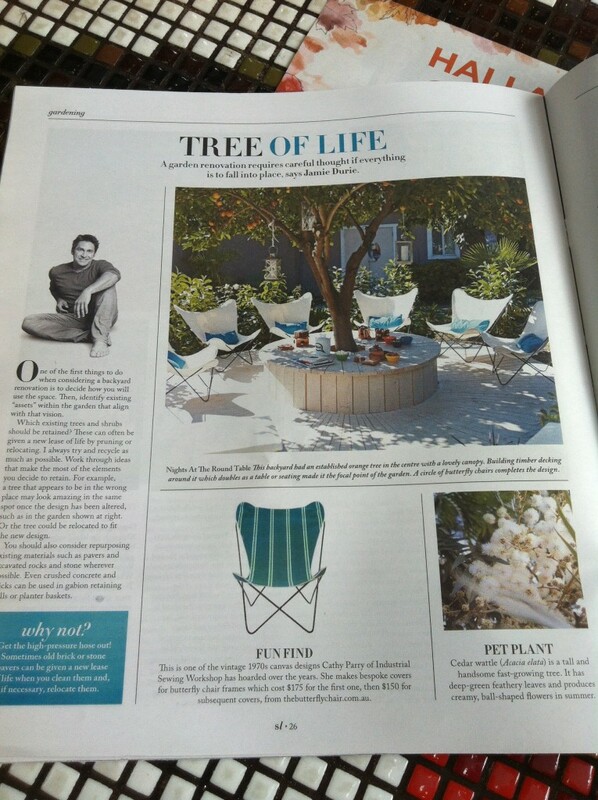 A lovely canvas cover even ended up in last Sundays Sunday Life magazine. Signup for our newsletter to get the latest news on new or seasonally pertinent products.